Crowtel Renovations is basically Fawlty Towers but starring a bird. It's Poultry Towers, in that it puts you in the role of a crow who is also a hotel manager. When the health inspectors show up, you have to toddle off and tidy up your dwelling place, while checking in on your most disruptive residents. There are nine floors full of hazards and colourful characters here, as you "attempt to fix up this trashy vacation spot and save a little crow's job". 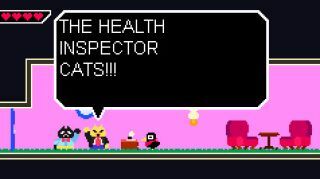 Based on a cute freeware platformer buried somewhere inside the Free Games of the Week, this remastered version of Crowtel comes with "an all new unlockable story mode, a developer commentary, as well as various bug fixes and additions". It's on Steam now, and if you like any of Pixel's games (Cave Story, Kero Blaster) I reckon you'd enjoy Crowtel too.